The first option, No Registration Required, is enabled by default. This means that the content isn’t gated at all. The second option, Registration Required After Number of Pages, allows you to specify when content will begin to be gated by a number of pages. If you put 5 in this field, for example, the user will have to log in after the first 5 pages. The third option, Registration Required after % of Pages, allows you to specify when content will being to be gated by a percentage of page. If you put 20 in this field, for example, the user will have to log in after 20% of the pages. 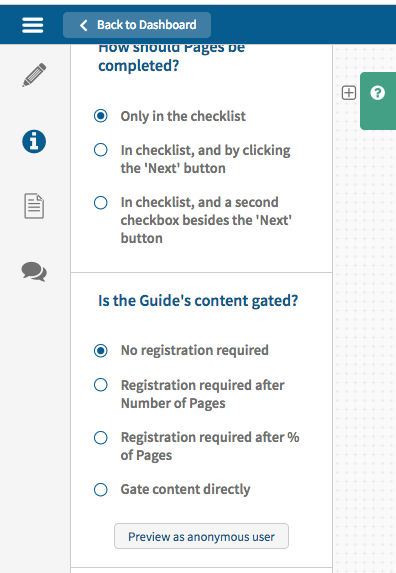 The fourth option, gate content directly, allows you to specify which pages or topics will be gated. In order to do this, click on this option in the guide details section. In the authoring canvas, right-click the page and toggle lock or unlock the content. Locked content will appear with a star. If you do chose to gate your guide, you can customize the screen they see when the gate is presented. 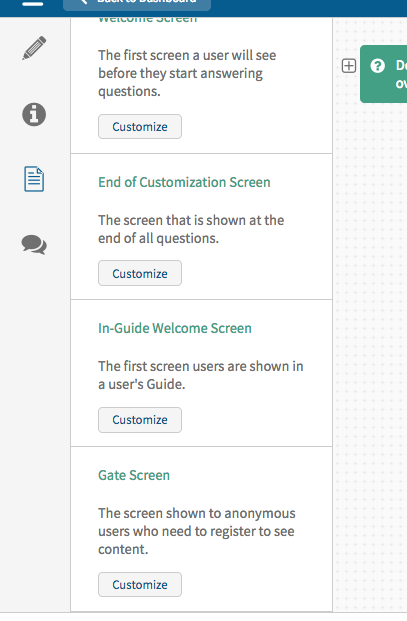 This customization is done in the authoring canvas’s customize tab.